For years, Lexus’s corporate face has enraged and upset critics everywhere. Spindle-grille, the automaker called it. Predator-face, others sneered. It’s even been accused of hurting some Lexus sales. And on Lexus’s current crop of cars, the criticism is rather valid. It is a damn huge grille. 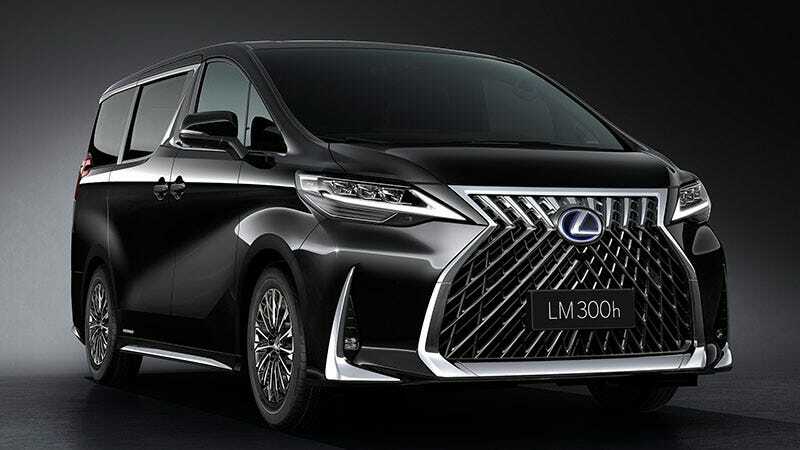 But on today’s newly unveiled Lexus LM 350 minivan? It works. Lexus nailed it. See, this grille was always a very vertical-heavy design. Lexus tries to make it fit on the SUVs and sedans, but the truth is those cars simply do not have the up-down real estate the grille really needs to spread out and be proportionate. On those cars, it just winds up looking kind of squashed and flat. Unwieldy. The LM already has a huge, tall and rectangular face. It’s perfect for large grille placement, which is exactly what Lexus did. There’s a lot of real estate on that face to cover, so why not do it with one, cohesive shape rather than break it up with a bunch of busy, horizontal slashes like Toyota’s other vans? Have you seen the Vellfire’s face? Girl. That thing has lines for days. And let me remind you that the Toyota Alphard is definitely not the last word in subtle refinement. It already has a sort-of Predator grille, but the indentations happen way too far down and make it look dopey. Also, black plastic and chrome? Yeesh. It reaches past the belly buttons of all of those (whom I assume are) Lexus executives. It’s so much cleaner this way, with the addition of taller “cheeks” on either side of the mouth. Finally, the grille feels proportionate and properly stretched out, like the first time you get to stretch your legs after a long flight. On the bottom half, the hourglass even flares out a little bit, giving off a sense of stability. It’s no longer top-heavy, it looks planted. It’s a great face for a great van. On the LC500, I accepted the grille. On the LM, I embrace it. Lexus finally did it—it made the Predator grille look good. It just took a minivan to do it.